December 2014 The woman in this image certainly appeared to be happy, perhaps largely because of the amusing way her hair was standing up from her head. But she was in great danger for that very reason. A highly electrified cloud was over her and the lookout platform there in Sequoia National Park, California. The huge electric field in the air above her drove some of the conduction electrons out of her body and into the lookout platform, leaving her positively charged. Thus, each strand of hair was positively charged, and the strands repelled one another. Many of them stood up in order to move away from the other strands. This might look like fun, but she was in danger of being killed by two processes. One, with the electric field that high, lightning could hit the platform, which would electrocute her. Indeed, minutes after she left the platform, lightning did strike the platform, killing the person that was still on it. The danger of being near a lightning strike, or being hit directly by lightning, is well known. The second danger she faced on that platform is little known and recognized only fairly recently. The electric field could have been strong enough to suddenly ionize the air molecules in a narrow channel above her head in what is called an upward streamer. Once freed from the molecules, the electrons would then be driven down along the channel, through her body, and into the platform. The ionized channel might then connect with ionizing channels that snake down from the storm clouds to complete a lightning strike. But even if it did not and remained isolated, the discharge through the woman could have been fatal. Here is a photograph in which you can see both a completed lightning strike and two separate upward streamers. Upward streamers appear to have been involved in a 2000 tragedy in South Africa. Under a large tent, 23 girls and 2 adults were asleep when lightning apparently struck one of the tent poles, leaving 4 girls dead and 19 injured. However, the burns marks and other evidence suggested that many of the victims were not hurt by the direct strike or by the strike branching out into adjacent objects. Rather they were hurt by upward streamers that developed in the intense electric field that brought the lightning to the tent pole. Upward streamers may be responsible for injuries at some outdoor sporting events. In this video link you see several football players knocked down during their game. There is a flash of light off camera to the left from a lightning strike to the playing field. The players could have been hurt by the resulting current through the ground, aptly call ground current. But they could have also been hurt by upward streamers from their heads. Notice how many of them clutched their heads, strongly suggesting upward streamers discharged into their head. In my textbook (Fundamentals of Physics in the American version and Principles of Physics in the international version) I show how we can estimate the amount of positive charge on the woman on the Sequoia lookout platform when an upward streamer is on the verge of forming. Let’s simplify her shape to be a narrow cylinder of height L = 1.8 m and radius R = 0.10 m. Let’s also simplify the charge distribution as being uniformly distributed along the cylinder. If the upward streamer is on the verge of forming, then the electric field has a critical magnitude of about E = 2.4 X 106 volts per meter, the so-called breakdown voltage of air. Because the cylinder is narrow compared to its length, we can use the formula for the electric field E outside a line of uniform charge: E = 2kd/r, where k is a constant of value 9.0 X 109 N m2/C2, d is the linear charge density (charge per length along the line of charge), and r is the radial distance out to where we measure the field. which is equivalent to 24 microcoulombs. If an upward streamer had formed, at least this amount of negative charge from the ionized air molecules would have flowed through the woman’s body in a few microseconds, producing a current of several amperes, more than enough to injure or kill. My point here is simple (simple enough to be on a tee-shirt): If your hair stands up, don’t pose for a photograph --- run for shelter. · Anderson, R. B., “Does a fifth mechanism exist to explain lightning injuries?” IEEE Engineering in Medicine and Biology, 20, No. 1, 105-113 (January/February 2001). This paper studies the South African tragedy. However, when I was showing the video in class a few years ago, I noted that the players were running during the flash. So, they did not have both feet on the ground. Also, and perhaps more important, many of the hurt players were clutching their heads. I now think that they suffered upward streamers. As explained in both The Flying Circus of Physics and my textbook, an upward streamer can occur when the electric field near the ground is strong enough to ionize air molecules. Once the electrons are pulled out of the molecules, they can flow down an ionized channel to the ground. In the video, the electron flow was down into the head of a victim and then through the body down to the ground. To see a photograph of a prominent upward streamer (near a lightning strike to a tree), scroll up to the first story here. · Anderson, R. B., “Does a fifth mechanism exist to explain lightning injuries?” IEEE Engineering in Medicine and Biology, 20, No. 1, 105-113 (January/February 2001). March 2008 One of the archived stories for July 2006 concerns the commonly asked question, “Does using a cell phone while outside during a lightning storm increase the danger of being hit by lightning?” My answer from the archived story is “no.” That is, using a cell phone has no affect on the chance that lightning will strike you. I know that a cell phone contains conducting materials. And I also know that the current of a lightning strike would travel through those materials more easily than through the surrounding air, which does not conduct well at all. However, to reach you, a lightning stroke must first jump through several kilometers of air. So, why would a centimeter of conducting materials make any difference? One counter argument involves comparing the cell phone to a lightning rod, which is intended to direct lightning to the ground. The lightning discharge occurs when the electric field between the ground and a thunderstorm cloud becomes large enough to ionize air molecules, that is, to remove electrons from the molecules. If the flow of those freed electrons reaches a building, it can overheat flammable parts of the building, causing a fire. It can also vaporize any water on the building wall, causing an explosion of the wall. To decrease the chance of such damage to a building, a lightning rod is mounted on the top of the building and connected by sturdy wire to the moist layer beneath the ground surface. That connection allows the rod to distort the electric field near it. If a lightning stroke comes near the building, that distortion can cause the stroke to hit the rod rather than the building. Then the current is sent safely down the wire to the moist ground layer, leaving the building unharmed. Could the conducting parts of a cell phone act as a lightning rod? Could you be holding something that makes a strike more likely? No. Because the cell phone is not connected to the ground, it does not distort the electric field near it. So, it does not attract lightning. However, using a cell phone in a lightning storm does carry a certain subtle danger, as seen in medical reports. If you happen to catch a side flash (current) from something near you that is struck by lightning, such as a tree, the current can be large enough to overheat the conducting parts of the phone. If so, then the hand and ear next to the phone might be burned. More serious, the current could overheat the phone’s battery, causing it to explode. That sudden burst of sound could damage your hearing. Even if the battery does not explode, the sudden heating of the air trapped inside the ear canal between the cell phone and the ear drum can cause the air to suddenly expand against the ear drum, damaging or bursting it. Here is another danger that has not been discussed in the medical reports. Even if lightning does not hit nearby, the electric field near the ground can be so high that the air molecules along a narrow column can be suddenly ionized in what is called an upward streamer. If the freed electrons in such a streamer happen to move through you, you will be shocked, and if you are holding a cell phone, that current can be large enough to cause the cell phone to overheat or explode. Of course, all this burning and explosion would also happen if you were to be hit directly by lightning. But then the damage to your hand and ear probably would not matter because hearing while dead is usually very difficult. An iPod is not much different from a cell phone except that the battery is not next to an ear. In one case where a jogger was hit by a side flash while running by tree, the jogger was thrown over 2 meters through the air. In addition to second-degree burns on chest and one leg, which I attribute to the side flash direct, there were also burns along lines across his chest and neck and up to his ears, which the researchers attributed to the overheating of the wires extending from the iPod player up to the earphones. There was also considerable damage done inside the ears, suggesting that either some of the current may have entered the body through the ears or the air in the ear canal had suddenly expanded. So, should you talk on a cell phone or listen to an iPod while outside when lightning is possible? Probably not, but here is the best reason --- you need to listen to the storm for clues about the nearness of any lightning and not drown out the storm with Metallica cranked all the way up to full volume. July 2006 Talking on a cell phone (mobile) while outdoors when lightning can occur may be dangerous. A person was seriously injured during such a conversation although I do not see how the circuitry of a handheld device could influence the (huge) discharge between ground and cloud. The person was probably just in the wrong place at the wrong time, but once the lightning hit, the conducting parts of the cell phone could have influenced the path of the current near the head. What is certain is that the rapid heating and resulting explosion of the phone caused extensive damage to the ear. So, if you think you are going to be hit by lightning, you best get off the phone. For references, see the preceding story. If you sit somewhat away from the door, you are probably safe. The safety might be increased if the windows are up and wet with rain, so that the current is in the water and does not jump into the car, though sometimes such jumps do occur. If the car is nonconducting (it is made of plastic), you may be in trouble, and parking under bridge may be the best temporary fix. If the car is a convertible, then your head is very much like a lightning rod attracting the lightning, even if the (nonconducting) top is up. The first of the following links will take you to a television show in which the host of the show sits in a car in a German high-voltage research facility. He parks the car between an overhead electrode and an underlying electrode, between which the electric potential difference (voltage) is gradually increased until the air is ripped apart in a dramatic discharge through the air between the electrodes and through the car. To be sure, the car was emptied of fuel because if a spark happened to jump through the vapor, it could have caused an explosion. (I don’t have any definite record of such an explosion occurring in any of the countless cars that have been struck by lightning, but fuel explosions sometimes occur when an airplane is struck by lightning.) The host talks about the warning he received from the facility’s technicians: Stay away from the car’s metal structure (door and perhaps the dashboard). We can describe the electrical situation in terms of either voltage or electric field. The voltage builds up until the air ionizes, that is, some of the outer electrons in the air molecules leave the molecules. We can also say that the electric field in the air builds up until the electric force it creates on the molecules rips electrons free of the molecules. In either description, the ionization produces a narrow channel of electrons and positively charged molecules. These freed electrons are shoved by the electric field along the channel and comprise the current of the electric discharge. The discharge connects to the metal of the car, where there are already free electrons that the electric field can move. As the electrons move, they collide with molecules, transferring energy to the molecules. In the air, these energized molecules cause the air to suddenly expand outward from the discharge path, sending out a pulse of sound that we can hear on the video. We can also see the discharge because of the light emitted by the energized molecules. All this sound and light is produced by the moving electrons. If part of the discharge path had been through the television host, the heating within him and the disruption to the controls of his breathing and heart pumping would have been lethal. That is why the technicians warned him to stay away from the metal frame of the car which carried the current, or otherwise the host would have been toast. Way cool video, TV host sitting in a car while it receives huge sparks at many hundreds of kilovolts. http://www.exo.net/~pauld/popularerrors/popularerrors.html This is an old photograph of a large spark to a (metal) car in which a man sits. The current stays on the metal frame and jumps across the insulating rubber tire. The man, being inside and disconnected from the metal frame, is unaffected. For references about lightning strikes to various types of vehicles, use the link at the top of this page. When lightning strikes a car, the current can be very large, perhaps as much as 500,000 amperes. You can be killed by a current of as little as 0.10 ampere, but the saving feature of a car is that the current will probably be restricted to the metal framework of the car. In fact, it may be restricted to the external surface of the metal. However, a convertible (with a nonconducting roof) offers little protection, and a car with a fiberglass body may offer no protection. In either type of car, you are effectively a lightning rod because your head extends above the conducting portions of the car. Thus, if your head is the highest conducting point along a flat, featureless road, you may have a serious problem in a lightning storm. However, if you are in a metallic car with a conducting roof, you are probably safe as long as you don’t hang your arm out the window. As suggested in the video, you probably should avoid touching any of the metal inside the car. 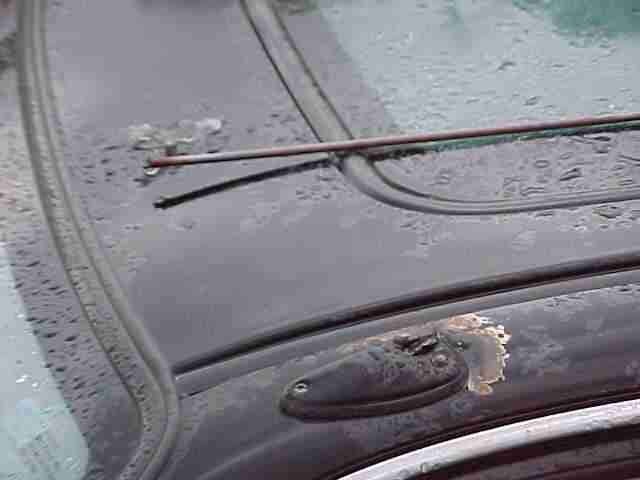 You should especially avoid touching the radio if it is connected to an antenna that extends upward from the car instead of being buried in the rear window. The lightning might not strike the antenna directly but part of the current could flash over to the antenna and then follow the conducting path to the radio. A car has four tires that resist current but that is irrelevant — if the current can jump through several kilometers of poorly conducting air, it can certainly jump through a few centimeters of air from the car body to the ground, bypassing the tires. There is a slim chance that if part of the current jumps across an open window, it might fork into the car’s interior. I have seen lightning fork into my bedroom through an open window when the current came down the outside of my house. In the car, you might want to keep the window up so that it is covered with rainwater which would give the current a low resistance path past the window. Finally, if you are ever caught in a lightning storm, stay in the car. You greatly increase your danger the moment you step out of the car. Lightning may not strike you directly but if it strikes anywhere near you, the ground current that spreads out from the strike point can be lethal. http://www.youtube.com/watch?v=K-O26xuAD1o This appears to show a car hit by a side flash from a tree hit by lightning. Aug 2009 On January 2, 2006, 12 miners died in a West Virginia coal mine after an explosion trapped them in a methane-rich section, 85 meters below ground. The cause of the explosion remains controversial, but it was probably a lightning strike that hit near the mine. This explanation is supported by instrument readings: A lightning detection network recorded a lightning strike near the mine that was simultaneous with the explosion, which was recorded by seismographs. However, such an explanation is quite puzzling. How exactly could a lightning strike initiate an explosion deep underground? The current in a lightning strike to the ground is typically confined to the top few meters, in what is called ground current. As explained in The Flying Circus of Physics, this is the current that is notorious for knocking down or killing anyone standing near a strike to the ground. So, the lightning current would not penetrate 85 meters through the ground to reach the mine. And experiments later conducted at the mine ruled out the possibility of current traveling down into the mine along some conducting path, such as a wire hanging down a bore hole. So, if the lightning initiated the explosion of the pocket of methane near the miners, how did it ignite the gas? The answer appears to lie in the electromagnetic fields set up by any lightning strike in a wide region around the lightning channel and ground current. The electric component of those fields can create potential differences along any conductor in the region, such that the two ends are at very different electric potentials, with strong electric fields at the ends, especially if the ends are narrow. In the investigation of the accident, such a conductor, an abandoned metal cable, was found at the site of the methane ignition. Tests suggested that when the lightning hit near the mine, its electromagnetic fields penetrated the ground down to the section of the mind with the pocket of methane and set up a momentary high potential difference along the cable there. Then the cable sparked into the methane gas, igniting the explosion and trapping the miners. Such sparking more commonly occurs up on the surface when there is a strong electric field between the ground and an overhead, strongly electrified cloud. These sparking displays, known as St. Elmo’s fire, can be seen on conducting objects, such as on boats, and even on the (partially conducting) branches of bushes (the legendary “burning bush”). However, such sparking on the ground is tame compared to what must have happened on that terrible day of the mine explosion, because on that day the St. Elmo’s fire occurred 85 meters below ground. The strike must have been extremely powerful. Most lightning strikes occur when the base of a storm cloud has an abundance of electrons, which are negatively charged. The presence of those electrons drives electrons away from the underlying ground, leaving the ground positively charged. This distributions of charges (abundant negative charge in the cloud base and abundant positive charge on the ground) sets up a large electric field in the intermediate air, and if the field gets large enough, a thin conducting channel suddenly appears between the cloud and ground. Electrons then move from the cloud, down the channel, and into the ground --- this is the lightning strike. The collisions of the electrons with air molecules produces light and heats them so rapidly that the air expands with an audible shock wave (the thunder). That is the common lightning strike, often termed a negative strike, but occasionally the charge flow is reversed in what is termed a positive strike. This time the cloud base is positively charged, which pulls electrons into the underlying region of the ground. If the electric field becomes large enough, a conducting channel opens up but now electrons move upward. Such positive strikes are typically far more energetic than the common negative strikes. Investigators believe that on the fateful day in 2006, a positive strike occurred near the mine and was powerful enough that it created St. Elmo’s fire on the abandoned cable 85 meters below ground, setting off the methane explosion that trapped the miners in section that then filled with methane. Physics is everywhere, and sometimes it is very tragic. Oct 2008 Ball lightning is a very mysterious luminous ball that floats over the ground or up in the air for several seconds. Some disappear quietly and others with an implosive pop. Ball lightning can travel through glass (from one side to the other) without harming the glass. They have been seen floating over power lines, down the aisle of airplanes, and across floors. Because faking a photo or video of ball lightning is easy with modern computers, I am very skeptical of any modern image claiming to show ball lightning. However, I recently saw a copy of a photograph that I know is real. It shows a ball lightning high in the sky, with a rainbow in the background and an eagle in flight in the lower part of the image. At first, I wondered if the ball was a bead in bead lightning. On rare occasion especially bright portions of a lightning channel can outlast the rest of the channel as it fades, giving a very brief impression of bright beads on a string. However, the bright ball in the photograph had a jagged tail trailing it. I think that the tail marks the still-glowing path of the ball and thus the ball was truly ball lightning, not a lingering bright spot in a lightning channel. If you are interested in buying the original photograph, you can write to photographer Thomas E. Bartholow, 2212 Rhonda Road, Brookings, SD 57006 USA or send a message to donnalee at swiftel.net, using the appropriate “at” sign instead of the word. If you are on the Flying Circus of Physics email list, you can use my email address to send a message to be relayed. Such electrical discharge globs may be related to the naturally occurring ball lightning. However, all the discharge globs lack one key element --- they don’t last long enough. Ball lightning can last several seconds, long enough to, say, burn a path across a physics professor’s carpet. June 2010 Sprites are huge flashes that occur far above a large thunderstorm. The light emission is due to electrical breakdown that is caused by the electric field set up by the charged clouds. In such breakdown, air molecules are ionized (electrons are removed) by the electric field and then the freed electrons are accelerated by the field. As those electrons collide with other molecules, the molecules are excited to higher energy levels and then emit light when they drop back to the lower levels. That much seems clear. The big mystery is why does this process occur at high altitudes (70 kilometers) and not just above the clouds (at 30 kilometers), where the electric field is surely stronger. Here is a simplistic explanation: Just after a large transfer of negative charge to the base of the cloud, there is a large amount of positive charge left on the ground. This arrangement of positive and negative charge, known as an electric dipole, sets up an electric field within the storm region and above it. If the field magnitude exceeds a critical value anywhere, then the air there undergoes electrical breakdown. The subtle point is that the critical value depends on the air density. Just above the clouds, the density is too high for breakdown and thus there are no sprites there. At higher altitudes (70 kilometers), the electric field is weaker because of the greater distance from the electric dipole, but the density is low enough that the field magnitude exceeds the critical value needed for breakdown. Thus, the sprites occur there. A short video showing the calculations for all this (based on an example in my textbook) is available at the Facebook site for The Flying Circus of Physics. All the material posted there (videos, photos, games, stories) are available even if you are not a member of Facebook, but if you are a member, consider becoming a fan of the site. You might also like to investigate two other mysterious sources of light that appear above huge thunderstorms: Blue jets appear just above the storm clouds, and elves (expanding horizontal rings) appear at an altitude that is even higher than that of the sprites. There is also the quite strange emission of gamma rays that might be associated with sprites. and scroll down to item 5.6 or search for “sprites”. February 2014 First a video of a cat and then of a dog. Now the build up for the explanation. When different materials are brought into contact, electrons can be transferred from one surface to the other at the points of contact. When the surfaces are then separated, one can be negatively charged because it gained electrons and the other positively charged because it lost electrons. This charging by contact is called triboelectricity. Rubbing usually helps build up the charge because it places more points in contact. Vigorous rubbing can also heat the surfaces, which can affect the amount of charge that is transferred. Although triboelectricity between two metallic surfaces is understood fairly well, triboelectricity between two insulators as in my examples is not understood. If you live in an environment with low humidity, charging by contact is commonplace. Perhaps the most annoying occurrence is in combing your hair with a hard rubber or plastic comb: The hair loses electrons to the comb, which means that all the hair strains become positively charged. Because they then repel one another, they tend to stick straight from your head, giving you a wild, frenzied look. In humid weather, the positively charged hair strains are quickly neutralized by airborne water or by conduction along the skin (which is enhanced by any moisture on the skin). You may have been amused by triboelectric charging of a rubber balloon by rubbing it several times across your hair. The balloon becomes negatively charged due to the electrons it picks up from the hair. Because rubber is an insulator, those extra electrons cannot shift around on the balloon’s surface. If you place the balloon on a wall, those extra electrons will drive some of the wall’s electrons away from the contact spot, leaving that spot positively charged. The spot and the balloon attract each other, and the balloon may stay on the wall for hours until airborne water finally neutralizes enough of the excess electrons to allow gravity to pull the balloon down the wall to the floor. Cat fur can also become charged upon contact with other materials. If you rub a cat with a dry hand, you become positively charged and the cat fur becomes negatively charged. The electrical potential difference between you and the cat can be several hundred or even several thousand volts. You must then be careful not to bring your fingers near the cat’s nose and mouth. Otherwise the excess electrons on the cat might flow to the nose and mouth and jump as a spark through the air to your fingers. The current is not dangerous because, although the potential difference is large, the amount of current is small. Nevertheless, cats do not like sparks. Below are several more videos in which someone (probably a dog lover instead of a cat lover) has charged a balloon and a cat, such that the balloon sticks to the cat. In the videos I don’t know if the cat and balloon were separately charged by contact with other materials or (most probable) if the balloon was rubbed along the cat as in the video up above. For the latter case, the cat becomes positively charged and the balloon becomes negatively charged. In this next video, a cat attempts to drink from a falling stream. However, I then noticed that the stream was deflected away from the cat. If the cat was noticeably charged, the stream should be deflected toward it. Finally I noticed that the deflection occurs only because the stream hits the top of the cat’s head. Cute, but no charging effects here. January 2008 Inside an inverted drinking glass, a wooden match is balanced on an upright coin. The challenge there in the pub is to make the match rotate about its support point on the coin without disturbing the glass or the coin. Thus, you cannot shake the glass to disturb the air inside it. The following link takes you to EasyBarTricks.com where this bar trick is demonstrated. http://easybartricks.com/bar-magic.html The title of the trick includes the word “magnetic,” but this is an electric effect. As you see, the secret is to use a common plastic pen that is charged by being rubbed on clothing. When the charged pen is brought near the glass wall, the near end of the match stick is attracted to it, which causes the match to rotate to bring that near end even nearer to the pen. The video gives you that much physics but if you want to win a bet in a bar (or in your family entertainment room), you better be prepared to explain more. Why does the trick fail if the room is humid or if a plastic toothpick is substituted for the matchstick? Why does the trick work even though the match is not charged by rubbing it against clothing? When different materials are placed against each other, some of the loosely held electrons on one surface can be pulled to the other surface. The surface gaining electrons is then negatively charged, and the surface losing electrons is then positively charged. Such charging occurs when a plastic pen is touched to or rubbed against clothing, but I don’t know which way the electrons move without knowing more about the two surfaces. Let’s say that the pen becomes negatively charged because it gains electrons. If the air is humid, the water in the air can quickly discharge the pen by removing the excess electrons, leaving the pen electrically neutral. Then the trick will not work. If the air is sufficiently dry to leave the pen charged, then the excess electrons on the pen create an electric field in the space surrounding the pen. The strength of the field decreases with distance from the pen, so for it to affect the match, the pen must be brought near the match. Although the match is electrically neutral, some of its electrons are loosely held by the atoms. When the pen is brought near the match, the electric field from the pen pushes these loosely held electrons in the match to the far end of the match. That forced migration leaves the near end of the match positively charged. Thus the negative pen and the positive near end of the match attract each other, and the match tends to move to decrease the separation between the pen and the near end. Although the match is still electrically neutral, with as much positive charge as negative charge, one end is negative and the other end is positive. Such a charge separation is said to be induced charge. This trick won’t work if the match is replaced with a nonconducting object, such as a length of plastic, because such an object does not have loosely held electrons that can be made to move to set up an induced charge. February 2007 Here is a common dorm prank: On a day with low humidity, you walk quietly up behind a friend and reach a finger out toward his ear lobe. When your finger is close to the lobe, a spark jumps between the two surfaces and your friend jumps up into the air with a shriek of surprise. Obviously you became charged as you walked toward him, but why? Unless you live in continuously humid conditions, you have probably been shocked by a spark after walking over certain types of floors and then reaching for a computer, door knob, faucet, or some other conducting object. In those sparking circumstances, walking over the floor charges you up and then the charge can be neutralized with a spark. The process can also be described in terms of electric potential (or voltage). As you walk, the electric potential of your body increases. When you reach for a conducting object, the electric field between you and the object becomes large enough to ionize some of the air molecules (tear electrons out of the molecules). Then the air becomes conducting and electrons can move along a path between you and the object. Those moving electrons collide with the air molecules along the way. The molecules emit light, and the energy dumped into the air along the spark’s path causes the air to rapidly expand, which sends out the sound of the spark. This much has been known for a long time, but the lingering question has been, “Why does your body become charged and the electric potential increase?” Here is a recently published explanation by T. Ficker of the Technical University of Brno in the Czech Republic, based on his measurements on someone walking over a nonconducting floor (electrons cannot easily move through the floor). Suppose you wear shoes with rubber soles and walk on such a floor. Electrons can move from the sole of the shoe onto the floor, leaving the sole positively charged and the floor negatively charged. The culprits. If both the sole and the floor do not conduct well (charge cannot move through them easily), the charges stay put. But your body and the floor support are both conducting. So electrons come down from your body to your foot, to be near the positive charge on the sole. And electrons in the floor support move away from the floor surface. You get two double layers (closely lying layers of positive and negative charge): (1) the sole and your foot, (2) the floor surface and just below the surface. Walking. As you walk, you leave the double layer on the floor in your trail but your shoe continuously touches fresh points on the floor and loses even more electrons. The result is that the double layer of charge of the sole and your foot grows stronger. Moreover, each time you raise your foot, the increased distance from the floor increases the electric potential (the voltage) on your body. So, you become more and more charged and each step increases the electric potential. If the air humidity is high, the water moisture quickly neutralizes the charge, and then putting your finger near the ear lobe of a friend is just weird. But if the air humidity is low, you eventually become charged enough to send a spark between finger and ear lobe. Walking in place. If you walked in place, touching the same points on the floor, you would not lose so many electrons and your electric potential would not increase very much. If you walked barefooted across the floor, you wouldn’t become charged at all because, with the foot conducting, you cannot build up a double layer of charge. Cats. Oh, by the way, you might enjoy sparking to a friend but never ever spark to a cat because its claws will extend outward by 20 cm (like Wolverine in X-Men) and then it will slice the clothes from your body, which is very embarrassing to explain to the emergency medical crew (and then to the animal protection agency). Dec 2009 Willard Wigan is renowned for his sculptures that are so small that they fit in the eye of a sewing needle. He sculpts his works from sand grains under a microscope. In the first image here (AP photo/UKFineArts, HO posted by oceandesetoiles on Flickr) we see President Obama and his family. You can follow the links below to see news video about Wigan and to read about his art. What caught my attention is the brief mention of static electricity that Wigan must contend with. Sand grains are fairly easily charged, which is why sand storms, such as haboobs in the Middle East, often displayed sparks. Wigan wisely works with most of his sculptures on metal objects, such as a sewing needle. If the needle is held by metal devices, then it and the sand grain can be grounded and thus kept free of charge. On a moist day, when the air has lots of moisture, the static charge would be eliminated by the moisture. But on a dry day, such as I experience in midwinter, objects that not grounded can become charged. If I walk across certain carpets on such dry days, I can produce a spark as I reach toward almost any conducting object, even another person. On such dry days even the airborne dust can become charged. This has been a serious problem in hospital surgical rooms where television monitors are used, because a monitor’s screen are naturally charged and thus can attract the airborne charged dust, along with the germs on the dust. Only fairly recently were these contaminated screens identified as being a threat to the sanitation required in surgery. If a sand grain being sculpted by Wigan becomes charged and is brought near any other charged object (even Wigan himself), the sculpture could be ripped free of its attachment by electrical forces. Of course, once the sand grain is airborne, it is lost. That apparently happened to his sculpture of Dorothy from the Wizard of Oz. One moment it was in sight; the next, it was gone. As Wigan quipped in one of the videos, he probably breathed in his Dorothy sculpture. May 2012 Take two empty Styrofoam drinking cups. Invert them and place them near each other on a table. They, of course, just sit there. Is there any way that you could repeat this and the cups move away from each other when you release them? This is another of the tricks from Eric Muller of the Exploratorium in San Francisco, as described in his wonderful book While You’re Waiting for the Food to Come: Experiments and tricks that can be done at a restaurant, the dining room table, or wherever food is served. To set up the trick, first lay down several plastic drinking straws (with any paper wrapping removed). Arrange them to be parallel and about a finger width apart. Then rub the cups across your hair. Provided that the air is reasonably dry, the cups become electrically charged. I don’t know if they pick up electrons from your hair to become negatively charged or lose electrons to your hair to become positively charged. Let’s assume that the former occurs. In that case, the Styrofoam molecules have a stronger attraction on the transferred electrons than your hair molecules. You rub each cup so as to make many more contact points between your hair and the cup, so as to increase the amount of transferred charge. Invert the cups and place them across the straws and near other, with the sides that touched your hair facing each other. When you release the cups, they will move apart slightly because the negatively charged faces will repel each other. March 2009 A few years a video sparked an international debate about the danger of starting a fire while pumping fuel (gasoline) at a fueling station. Here are two links to that video (don’t worry, the woman in the video is not harmed). The debate has centered on what caused the fire and, although no cell phone appears in this video, the cause of such fires has been widely attributed to the use of cell phones. To find the actual cause of the fire, let’s follow the woman’s actions. The situation was perfectly safe when she began to pump the fuel and set the control on the pump handle so that fuel continued to flow even after she released the handle. However, the situation changed when she slid into the car seat and then back out again without touching either the car or any other large metallic object. Things were made even worse (perhaps much worse) when she adjusted her sweater. As result of that move and her contact with the car seat, she became highly charged, with an electric potential that could have been 10,000 volts relative to surroundings, or even larger. If you live in a dry environment, such as found in the winter here in Cleveland, Ohio, you might be well aware of the charging due to contact with a car seat or with the adjustment of clothing. The contact of different materials, such as your clothing and skin or your clothing and the car seat, can cause a transfer of electrons from one of the surfaces to the other. Many types of material have electrons that are loosely held by the surface molecules, in contrast to the more tightly bound electrons deeper in the atoms. These conduction electrons, as they are called, can move from the surface of one type of material to the surface of a different type wherever the two surfaces make contact. The transfer is due to the molecules on one surface attracting the conduction electrons more strongly than the molecules on the other surface. The two surfaces may have initially be neutral (with not net charge) but the surface that gains electrons becomes negatively charged because electrons are negatively charged, and the surface that loses electrons is left positively charge because of the deficit of electrons. In humid weather, the humidity quickly neutralizes both surfaces and you probably will not notice any charging effects. However, in dry (non-humid) weather, the surfaces can become noticeably charged, especially if they are rubbed together. (The point of the rubbing is not to rub electrons off a surface. You cannot rub off an electron like dirt from a shoe. The point of the rubbing is that many points on the two surfaces are put into contact, allowing a greater electron transfer between the surfaces.) This is exactly what the woman in the video does when she slides into and then back out of the car seat and when she slides her sweater over her skin. If you live in a dry climate, you may have noticed the charge on your body when you slide out of a car and then reach back with your fingers to close the car door. A spark may jump between your fingertips and the car. Without knowing more about the particular materials involved, I cannot predict if the sliding leaves you negatively charged (with extra electrons) or positively charged (with a deficit of electrons). Let’s assume that you are negatively charged. As your fingertips approach the metal door, the negative charge on the fingertips repels the conduction electrons in the nearest portion of the metal, causing them to move away and thus leaving that part of the metal positively charged. The two sets of charges (negative on your fingertips and positive in the nearest part of the metal) create an electric field in the intermediate space. As that gap decreases, the field grows stronger and can eventually be large enough to pull electrons out of the air molecules, that is, ionize the air molecules. Just then a narrow conducting path consisting of positive ions and freed electrons exists between your fingertips and the metal, allowing the electrons on you to race across the gap to the metal. The sudden and brief dump of electrons from you is the spark that you see, hear, and feel. The electrons moving along the path collide with the ionized air molecules, transferring energy to them. That deposit of energy heats the pathway, causing the air there to glow and to suddenly expand against the surround air, sending out a sound wave that you can hear. The sudden flow of electrons into the pathway from your fingertips heats the fingertips, perhaps causing to yelp with pain and say a few rude words. If you routinely encounter this problem, you have probably learned to close the car door with your elbow, your foot, or even your rear end, because a blunt object (with its charge spread over a large surface) does not produce an electric field that is large enough to ionize air molecules. Thus there is no spark and you may not even notice that you discharge to the metal. Well, the woman in the video apparently charged herself significantly and then reached for the fuel pump handle, causing a spark between her fingers and either the car or the pump handle. However, the space held not only air molecules but also fuel vapor that was escaping from the flow of fuel into the car. The spark apparently lasted long enough to provide enough energy (at least 50 millijoules) to heat the vapor in the conducting path to its ignition temperature. A less energetic spark would not have ignited the fuel vapor. I figure that she had at least 4 microcoulombs of charge and was at a potential of at least 20 000 volts. When you are pumping fuel in a dry environment, you should not slide into and then back out of the car or readjust your clothing. But if you do, you should discharge yourself by touching the car or some other large metal object well away from the fuel vapor. Here is a second video showing a fire at a fueling station but let me warn you that this victim eventually died from his injuries, so you may want to skip this video and just read my description. The video shows a gasoline truck pulling into a gasoline station to transfer fuel to the station’s underground tank. At one point, a man climbs to the top of the truck to get things ready for the transfer. We don’t have a complete view of the man but we can see him put his left hand into his left pocket and then pull it out again. He must have opened the top of the fuel tank and allowed vapor to escape because soon after he pulls his hand out of the pocket, the vapor explodes, throwing him onto the ground with his clothes on fire. His motion in climbing onto the truck and then walking along its top may have left him with a significant charge. The adjustment of his hand and pocket may have charged him. However, my guess is that the truck or the fuel was significantly charged when the truck entered the station. Any moving vehicle is usually highly charged by the contact of tires on a roadway, and a gasoline truck can become even more charged due to the sloshing of the fuel inside its big tank. Typically, however, when a vehicle stops, the charge bleeds off through the tires and after a few seconds the remaining charge is too small to cause a highly energetic spark. Another explanation about fuel station fires has appeared on the web --- cell phones somehow ignite the fuel vapor. Yes, they are electrical devices but they provide no sparks that could ignite a vapor. If a cell phone provided energetic sparks that significantly heated its immediate surroundings, would we be carrying them around in our pockets? That is, with a cell phone in your pocket, would not each incoming call be a very painful and burning experience? Here is my favorite video that explores the possibility of a cell phone setting off a vapor fire and explosion. Its message is clear --- clothing and sliding on a car seat provide the danger, not a cell phone. So, if you spot someone talking on a cell phone while pumping gas, you should not be afraid. But if you spot someone who is first sliding around in a seat while “car dancing” to the radio and who then gets out to pull the pump handle out of the car, drive away very quickly. March 2008 Last month, a terrible explosion blew apart a sugar factory in Port Wentworth, Georgia, here in the US. Many of the workers were killed and many others were severely hurt. The cause was not natural gas, chemicals, or any other obvious explosive element. No, it was the sugar itself. Although bulk sugar is not easily burned if you put a burning match to it or run current through it (the ignition temperature is about 400ºC), airborne sugar dust can be ignited fairly easily. Indeed, many types of powder, from kitchen flour to cosmetic powders, are very dangerous if airborne. The difference (and thus the danger) lies in the fact that, when airborne, each grain is surrounded by the oxygen in the air. If the temperature of a dust grain is raised to a certain value by some means, the grain can then react with the oxygen and burn. If there were only a few grains, nothing much would happen. The deadly situation occurs when the airborne dust is fairly thick. Then the initial burning of a few grains releases enough energy to raise the temperature of surrounding grains beyond the critical point, and then they too burn and release energy that heats grains a bit farther out, and so on. This all occurs so rapidly that the burning becomes an explosion. And that is apparently what happened in the Georgia sugar factory. The amount of energy that can be released in a dust explosion in even a moderate size room that is filled with airborne dust can be devastating. The kitchen area in a restaurant near my school was blown apart by the explosion of airborne flour when the flour was being pumped into a holding vat from a supply truck. Luckily, no one was injured. A trigger is always needed for any explosion of airborne dust. I think it is nearly always a spark, either from a malfunctioning electrical device or from people moving around or changing their clothing. If the air is dry, pulling off a sweater can cause a huge charge separation between the clothing and the person. If you live in a dry environment, you probably know that such charge separation can cause sparking. My bet is that a spark ignited the sugar factory, but we’ll never know what exactly caused the spark. April 2014 Often, a burn victim is treated while lying on a gurney (a bed with wheels) in an enclosed chamber filled with oxygen-enriched air (a hyperbaric chamber). Once a treatment is over, a hospital worker pulls the gurney and patient from the chamber, to be rolled away. On several occasions, in different hospitals, a gurney caught fire at the end that was the last to leave the chamber. Obviously, a burning gurney holding a patient already suffering from burns is a dangerous situation, and obviously fires burn easily in air rich in oxygen, but the question remains: What caused the gurneys to catch fire? Investigators realized that charge separation occurred between the patient’s skin, the hospital gown on the patient, and the sheet on the gurney, much like you might experience on a low-humidity day when your clothes slide over your skin. Where the patient’s skin made contact with the cloth, some of the loosely bound electrons of the skin molecules were pulled onto the cloth surface, making the gurney negatively charged. As the gurney gained electrons, it drove electrons out of the underlying metal framework of the chamber, leaving the framework positively charged. The negatively charged gurney and the positively charged framework then formed a capacitor. In my textbook I introduce a capacitor in its simplest form: Two metal plates face each other with a small separation. The plates are then connected to a battery, which makes one plate positively charged and the other plate negatively charged. There is then a potential difference (measured in volts) between the two plates, and energy is stored in the electric field between them. In the gurney case, the charging occurred because of the skin–cloth contact rather than a battery. Still, there was a potential difference between the top plate (the gurney) and the bottom plate (the framework), with a potential difference and stored energy between the two plates. When you have two oppositely charged objects near each other, the loosely bound electrons on the negative object might jump to the positive object in a spark. Did such a spark jump between the gurney and framework and ignite the gurney? Measurements by the investigators revealed that a spark could have occurred only if the potential difference on the gurney–framework capacitor exceeded 2000 volts and that a fire could be started by a spark only if the capacitor’s energy exceeded 0.20 millijoules. However, the potential difference on the gurney–framework capacitor was only 600 volts, not enough to produce any spark and certainly not a spark that was energetic enough to cause a fire. So, how did the fire start? The answer came when the investigators considered the motion of the gurney as it was pulled from the chamber, which was when the fire began as the gurney was nearly all the way out. During that motion, the charge on each capacitor was trapped and thus could not change. However, as less and less area on each plate faced each other, the charge on each plate was squeezed into a smaller and smaller area. The increased concentration of charge on each plate increased the potential difference between the plates. Could the potential difference have reached high enough value that a spark jumped between the gurney and framework? I used this story of the burning gurney in an earlier edition of my textbook Fundamentals of Physics (or the international version, Principles of Physics). (It is still available in the associated online material in WileyPlus). In the example I explained that the amount of charge q on either plate of a capacitor is proportional to VA/d, where V is the potential difference between the plates, A is the area of each plate facing the other plate, and d is the plate separation. As the gurney was pulled out of the chamber, the charge q and the plate separation d were constant but the area A decreased. So, the potential V had to increase to offset that decease in A. When area A had decreased to 1/10 of its original value, the potential V had increased to 10 times its original value, that is, to 6000 V. That potential difference was large enough to drive a spark between the gurney and framework at the end of the gurney that was the last to leave the chamber. Moreover, with the potential difference that high, the energy released by the spark was 0.45 millijoules, more than enough to cause a fire. The investigators published their analysis in 1980, but the same problem occurred later, as you can see in the linkage below to a newspaper report from 1990. The glow is not fully understood but must be due to the separation of charges as one layer of the tape is separated from another layer or some sort of backing. As the two surfaces separate, they are dotted with patches of negative charge (excess electrons) and positive charge (deficiency of electrons). Some of the electrons then jump through the air that flows into the space between the separating layers. The electrons are accelerated through the air by the electric fields between the patches. Thus the electrons gain kinetic energy due to the propulsion, but they transfer a lot of their energy to the air molecules whenever they collide with the molecules. The molecules are then briefly in an excited state (they have more energy than normal) but they quickly de-excite by emitting energy as light. That is the light you see in the glow from the tape as it is peeled. Recently a paper was published by Carlos G. Camara, Juan V. Escobar, Jonathan R. Hird and Seth J. Putterman of the University of California at Los Angeles that X rays can also be emitted by tape as it is peeled. An X ray is a form of an electromagnetic wave, just like visible light, but it is at a higher frequency. Producing X rays requires a lot more energy than producing visible light, and finding such a high-energy mechanism in the simple peeling of tape seems challenging. Still, the researchers were able to use the X rays to take an X-ray image of a finger. However, there is a hitch --- the tape must be peeled in a vacuum to produce the X rays. Also, even if the tape is peeled at a steady rate, the X rays come only in bursts, not continuously. When I read the research paper, I immediately recalled the reports by astronauts about seeing flashes of light when in space, even when their eyes were closed. The flashes appear to be due to X rays, gamma rays (another form of an electromagnetic waves but at much higher energies), and high speed particles that stream from the Sun or from other stellar sources. When these waves or particles collide with a photoreceptor in an astronaut’s eye, they trigger a signal to the brain that is perceive as being due to a flash of visible light. I wondered, can X rays from the peeling of tape produce flashes of light in my eyes? Well, no, because I obviously do not live in a vacuum. Still, I checked by first dark adapting my eyes and then peeling tape from a roll immediately in front of my closed eyes (closed to block the visible glow) and then peeling tape directly from my closed eyelids (which hurt like crazy, but nowhere as much as the PChem exams I used to take). No X-ray induced flashes of light appeared. Too bad. Their appearance would justify your date spending at least another 15 minutes in the dark. September 2014 You and a friend first adapt your eyes to darkness for about 15 minutes in a closet or outside on a moonless night. Then have your friend chew a wintergreen LifeSaver candy (a candy in the shape of a marine lifesaver and infused with the oil of wintergreen) with the mouth as open as possible so that you can see inside. Why does each bite initially produce a faint flash of blue light, and why do later bites fail to produce the light? (If you don’t want to eat the candy, squeeze it with a pair of pliers until it fractures.) Recording the brief, faint emissions of light with a camera is tricky but here is a video that is pretty good. Whenever a bite breaks one of the mint’s sugar crystals into pieces, the pieces will probably end up with different charges. Suppose a crystal breaks into pieces A and B, with A negatively charged and B positively charged. Some of the electrons on A will then jump across the gap to reach B. Because air has moved into the gap after the crystal breaks, these electrons jump through air. Those that collide with nitrogen molecules in the air transfer energy to the molecules, exciting them. When the molecules de-excite, they emit in the ultraviolet range, which you cannot see. However, the wintergreen molecules on the surface of the candy pieces absorb ultraviolet light and then emit blue light, which you can see—it is the blue light coming from your friend’s mouth. This process of absorbing light in one wavelength range (here, in the ultraviolet) and then emitting light in a longer wavelength range (here, blue light) is called fluorescence, and the process of producing light by fracturing crystals is called triboluminesce. In this next video, sugar crystals are continuously crushed in a high-speed blender. When shot from overhead by a low-light camera, you see a luminous ring in the blender. As the larger crystals are broken up into smaller crystals, the light gradually fades. December 2015 Well, maybe I should switch the title from “pub trick” to “disco trick” to match the title of one of the research papers listed below. Indeed, this is a demonstration that is suited for a disco (or dance hall) with black lights, alcohol, and snacks. Pour some tonic water into a transparent glass and then, with the room lights off or at least dim, illuminate the liquid with a black light (UV lamp) such as some jewelers use to identify precious stones. The illumination should preferentially be from above the container because the glass wall might absorb too much of the light for the demonstration to work. The tonic water will fluoresce with blue light. So, it absorbs light that you cannot see and then emits light that you can see. If you drink the tonic water and wait until you are ready to urinate it out, you can collect the urine and place it in the UV light. It too will fluoresces. (This procedure was used in a classroom lab experiment as reported in the paper by O’Reilly listed below, rather novel I think.) Indeed, you might have fluorescing urine for a few days, but that fact is hardly something you should share with others if you still want to have them as friends. The fluorescence of tonic water can be quenched (diminished or even eliminated) if common table salt (sodium chloride NaCl) is added to it. In general, quenching of a liquid fluorescence can be due to either (1) an ion joining the fluorescing complex, creating a new non-fluorescing complex, or (2) a mechanical de-excitation of the complex due to collisions. With tonic water, the quenching is due to the collisions between the excited state quinine and the chlorine ions released when the added salt disassociates into Na+ and Cl-. So, at a disco where black lights play across posters and snacks are served along with, say, a gin and tonic, you got the makings of a physics and chemistry demonstration. Now you have the perfect excuse to go there. March 2011 Under certain weather conditions, you might see electric sparks at the top of a ship’s mast or at the tips of other slender objects such a branches on brush or trees. As explained in The Flying Circus of Physics book, the sparks are called St. Elmo’s fire or corona and are due to electrical breakdown of the air adjacent to fairly sharp, conducting objects such as a ship’s mast, an antenna, or an airplane wing. When the electric field in the air is stronger than normal, it can be very strong at the tip of a conducting object, where charges in the object can gather. If the field strength in the air next to the tip exceeds a critical value, the field can pull electrons out of the air molecules and accelerate them. When these electrons collide with air molecules, they excite the molecules and also make them move faster. The eventual de-excitation of the molecules produces light that can be seen. The increased motion of the molecules means that the temperature of the air has increased, which can lead to the sizzling or hissing sometimes heard with the discharge. St. Elmo’s fire is not normally considered to be dangerous. Here are some links where you can St. Elmo’s fire on or just outside the windshield of an airplane. http://www.youtube.com/watch?v=6rAX0YR0wvs St. Elmo’s fire as seen through the cockpit window on an airplane! http://www.youtube.com/watch?v=4sA-Hk_jnPg Video of intense St. Elmo’s fire on windshield of airplane and very scary moments for the flight crew. http://www.youtube.com/watch?v=6ioN-3UWYrY Video. Note the lights off to the right. http://atmospherical.blogspot.com Way cool blog site with lots of photos and descriptions. Go through the archived blogs by clicking on the button at the bottom of the page. The blog started in April 2006. A photo of St. Elmo’s fire on a wing tip is given for May 3, 2006. Oct 2009 Here is a video showing a technician being lifted by helicopter to a high-voltage power line to repair the line while it is still under full voltage at 230 000 volts. Why is he not killed when he touches the line? After all, people are often killed in home or industry when they accidently touch electrical devices at much less voltage. Electric potential is measured in volts but the assignment of the numbers can be whimsical. Touching a point that has a large assigned voltage is not necessarily dangerous. The true danger lies in a voltage difference, because that difference can create an electric field that can drive charged particles in a current. Such motion of charged particles is the real danger. Suppose that you accidently touch a faulty electric device so that your left hand is at a different voltage than your right hand. That voltage difference would produce an electric field across your chest, causing charged particles (electrons and ions) to move. As they move, they would collide with material in their path, transferring energy from their kinetic energy to thermal energy in the material. In short, the path would heat up. The moving charged particles can also disrupt normal electric signals within your body, signals that are needed for proper muscular control such as in breathing and the beating of the heart. If the voltage difference between your hands is small, the effects of the charged particle motion is also, perhaps imperceptible. However, if the voltage difference is large enough, you can suffer fatal internal burning and disruption to breathing and blood flow. A power line carries an alternating current, which is controlled by an alternating voltage at the electric plant. That is, the voltage varies in a periodic way, causing the electrons in the wire to oscillate parallel to the wire’s length. They move back and forth by only a microscopic distance, but such motion inside a human body would be much more than enough to kill the person. If a technician needs to be lifted up to a power line, to touch it in order to repair it, he faces two major challenges. 1. He rides in a helicopter that is effectively at the voltage of the ground back at the takeoff point. So, if the technician reaches out to touch the line, there is a huge voltage difference between what he is touching and the helicopter behind him. It would certainly be a fatal situation. 2. Even if he could touch the line, the electrons in him would then undergo the alternating motion because his body would then effectively be part of the line. To solve the first challenge, as he approaches the line, the technician extends a metal rod, called a wand, toward the line. The rod is electrically connected to the helicopter and the technician. The voltage difference between the line and the outer tip of the wand is initially so large that air molecules in the intermediate path are ionized. That is, electrons are ripped out of the molecules and then accelerated. As the electrons crash into other air molecules, they cause the molecules to emit light and to move about randomly and rapidly. In the video you can see sparks between the line and the wand because of the light emission by the air molecules. You can also hear the sparks because the rapid heating of the air causes the air to rapidly expand, which sends out small shock waves of sound. After a few seconds, enough charge has been exchanged between the line, helicopter, and technician, that everything is at the same voltage. At that point the technician can safely clamp onto the line or touch it, and the repair work can begin. To solve the second challenge (to avoid being part of the line’s current), the technician is nearly fully enclosed in a conducting (metallic) suit and helmet in order to be protected by what is called the Faraday cage. The current of the power line does not penetrate such an enclosure; rather it stays on the conducting suit and helmet. Of course, the face is not covered and, during the repair work, the technician may choose to work with bare hands. Still, the currents on him are usually small. However, grabbing the line with bare hands might cause the hands to go numb for a while. Experienced power line technicians do not seem to mind such temporary results. In short, when a high-voltage power line needs to be repaired, it need not be shut down, which might shut down part of a city. Instead, a technician can use good solid physics to repair it while it is still at full voltage. Although I understand that physics, I still marvel at the first man to put it to the test. His first touch tested more of his belief in the laws of physics than any common class exam or even a PhD dissertation could ever test. http://library.thinkquest.org/TQ0312210/house%20covered%20in%20dust.jpg Photo of house almost covered with sand and dirt. p. 197: Chains were dragged from the cars in an attempt to drain the charge from the car body before it shorted out the battery. In a dry environment, airborne grains of dust can become highly charged due to a charge transfer every time the grains strike the ground or one another. In each such contact, loosely bound electrons in the atoms on one surface can be pulled to the other surface. Then the surface that gains the electrons is negatively charged, and the surface loosing the electrons is positively charged. In a dust storm, a grain can undergo countless collisions and charge transfers, and the whole cloud can become highly charged and then charge any obstacle in its path. Such a highly charged dust cloud that sweeps across the ground can undergo a sudden discharge if a spark leaps between the cloud and either the ground or something connected to the ground. Such sparking occurs where the electric field between the ground and the charged cloud is so large that it rips the outer electrons out of air molecules, providing a conducting path between the ground and the cloud. As electrons are accelerated along that path, they collide with air molecules, causing them to emit light. The energy transferred to the molecules rapidly raises the temperature of the path, which then expands so rapidly that a sound pulse is emitted. Thus, you can both see and hear the discharge of the cloud. Shorter sparks, commonly known as St. Elmo’s fire, can also occur, especially near pointed objects such as branches or fence posts. At such a pointed object, the electric field can be large enough to ionize the air along paths extending up to several centimeters from the object. The electrons momentarily freed from the atoms are accelerated by the electric field and crash into other atoms, creating light and sound. Repeated St. Elmo’s fire can ruin vegetation. Indeed, Egan describes how the discharges blackened leaves. I can easily see that the more powerful sparking could be quite painful to people, perhaps causing them to bend over because of muscle contractions produced by the electricity. But could a jackrabbit be electrocuted? Perhaps. Its long, pointed ears may be cute but they were effectively lightning rods when a highly charged cloud swept over the ground. http://www.youtube.com/watch?v=HFW7PABbJYQ Modern day haboob dust cloud. Note the light from a lightning flash. http://www.youtube.com/watch?v=fNOOVDNUDOQ&NR=1 Another haboob. Note the vehicle driving out of the cloud. Visibility inside the cloud must have been negligible. June 2009 One of the more terrifying sights in a desert containing sand or dirt is a haboob, as you can watch in these videos. When a strong wind blows over sand or dirt, the particles are made to skip in a motion call saltation. The faster the wind blows, the higher the particles jump, but for horizontal winds the layer is usually less than a meter high. In a haboob, a strong cold front moves along the ground, following a strong upward convection. That upward motion can lift the particles by several kilometers, producing a moving wall of sand and dirt. In meter-high saltation, the particles typically become negatively charged. That is, as they lift from the ground they carry extra electrons and leave the ground positively charged. Such charge separation also occurs in a haboob but the much higher layer also allows significant charge transfer between the airborne particles. This mixture of charged particles can produce strong electric fields within the haboob. Sometimes in dry weather (such as during the winter here in Cleveland, Ohio), I can sense a strong electric field by the hairs on my arm. For example, in one of the archived stories here at this site I describe how the walls in one of the campus toilet booths become highly charged when they are cleaned. When I enter the booth, the hairs on my arms extend toward the walls. I can find no reports of anyone having a similar sensation during the approach of a haboob, but it may go unnoticed because people are so concerned about getting into shelter to avoid breathing the airborne sand and dirt. September 2013 In the movie The Hunt for Red October, Jack Ryan is lowered from a US helicopter toward the Russian submarine Red October, to land on the submarine. He has been warned about the electrical shock he will receive because the helicopter will be at a different electric potential than the submarine and surrounding water. Indeed, one of the two Russians on the conning tower who attempt to snag the daggling Ryan warns the other to grab the lowering line instead of Ryan himself. Nevertheless, Ryan sways so close to one of the Russians that a spark jumps between them, causing the Russian to fall over onto the side of the conning tower. You can see the spark in this movie clip --- it occurs about three minutes into the clip. Although the scene is in a movie, the danger of sparking between a helicopter line and someone on the ground or in the water is real. Here are two examples in which a scoop is lowered from a helicopter to pick up water. Helicopters and airplanes become charged as they fly because of “contact charging” with dust grains and water drops, especially if they fly through clouds. In each such contact, electrons can be transferred between the two surfaces, building up the electric potential on the aircraft. Here is a nice video in which you can see sparking as the fuel boom is lowered from a USAF KC-135 to a USAF E-4 in preparation for aerial refueling. As the boom nears the E-4, you can see huge sparks. As soon as the boom reaches the receptacle on the E-4, electrical contact is made and the sparking disappears. However, a faint discharge called St. Elmo’s fire could still be seen by the crew in the KC-135. That type of discharge is due to electrical breakdown of the air adjacent to fairly sharp, conducting objects such as a ship’s mast, an antenna, or an airplane wing. When the electric field in the air is stronger than normal, it can be very strong at the tip of a conducting object, where charges in the object can gather. If the field strength in the air next to the tip exceeds a critical value, the field can pull electrons out of the air molecules and accelerate them. When these electrons collide with air molecules, they excite the molecules and also make them move faster. The eventual de-excitation of the molecules produces light that can be seen. 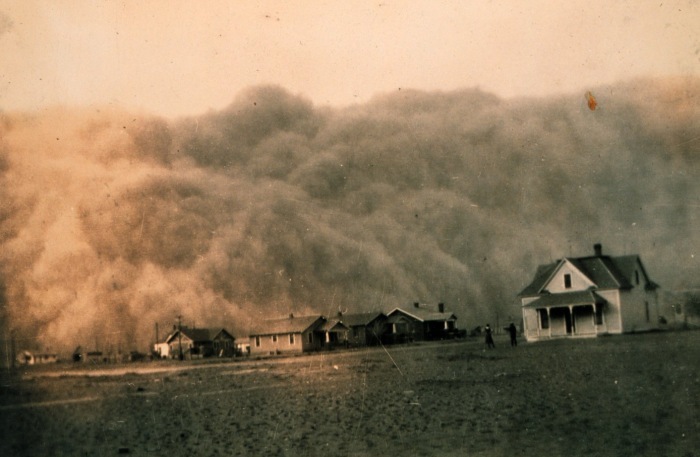 In dust and sand storms, such as seen in the Dust Bowl days of the US and as seen in modern times in deserts, the air-borne grains become charged when they collide with one another. In such a collision, one grain loses one or more electrons, becoming positively charged, while the grain in the collision gains those electrons, becoming negatively charged. Such charge separation can leave small pockets with a net negative charge and other small pockets with positive charge. If the charge separation is large enough, electrons will jump through the air from negative sites to positive signs. Along the way, the electrons collide with air molecules, exciting the molecules to higher energy states. The molecules almost immediately deexcite by emitting light. We can thus see the spark. In the photos at this following site we see such light emission from dust and sand grains that are forced into collisions by the blades on a helicopter. The photos are spread across the web although they were copyrighted by Michael Yon, who has proposed the effect be called the Koop–Etchells effect after Corporal Benjamin S. Koop (U.S. Army) and Corporal Joseph Etchells (U.K. Army) who died in Afghanistan in 2009. The discharging gives a fairy-like quality to the scenes. However, in a combat situation at night, lighting up your aircraft is exactly what you do not want to happen. May 2010 This image by Marco Fulle (ww.stromboli.net) shows the Icelandic volcano Eyjafjallajokull whose ash emission caused severe disruption of air travel in Ireland, England, the Scandinavian countries and much of Europe. Note the electric discharge on the left side. In the following video and photographs, you can see additional electric discharges. Although the discharges were dubbed “lightning” in news reports, they are not lightning discharges in a thunderstorm, with electrified clouds of water drops discharging to the ground. Instead, they are due to the emission of ash. That ash results when liquid water within the volcano, suddenly converted to steam by the flow of hot lava, shatters rock, which is then burnt. The liquid-to-steam conversion and the explosion of rock cause positive and negative charges to separate. Then, as the steam and ash are spewed into the air, they form a cloud that contains pockets of positive charge and pockets of negative charge. As these pockets grow, the electric fields between adjacent pockets and between pockets and the volcano crater increase in magnitude. When the magnitude of the field reaches about three million volts per meter, the air undergoes electric breakdown and begins to conduct current. These momentary conducting paths appear in the air where the electric field has ionized air molecules, freeing some of their electrons. These electrons, propelled by the field, collide with air molecules in their way, which causes those molecules to emit light. We can see these briefly lasting paths, commonly called sparks, because of the light they emit. The sparks above the volcano snake their way either down from a charge pocket to the crater wall (or ground) or vice versa. You can tell the direction of a spark by how any dead-end branches on it are forked. If the branches fork downward, then the spark snaked its way downward. If the branches fork upward, then the spark snaked its way upward. Sometimes a downward-snaking spark and upward-snaking spark meet each other. July 2006 As discussed in the book, surgery teams take care not to bring their fingers near a monitor's screen because the electric field near the screen can attract air-borne particles that carry bacteria. Carelessly pointing toward part of an image of, say, an internal organ on the screen can contaminate a surgeon's gloved fingers. If the surfergon then touches the patient (especially the interior), the patient can become infected. Researchers have also discovered that plastic aprons commonly worn in surgery to guard against the splattering of fluids (usually blood) can also become contaminated. When an apron is pulled from its package and put on against the usual “scrubs” clothing, the apron can become charged by contact. (One surface can pull some of the electrons from another surface touching it and thus become negatively charged, while the other surface becomes positively charged.) Because the apron is plastic, it is nonconducting and thus the charge is trapped in place. The charge creates an electric field in the space surrounding it, which then can attract airborne dust, skin cells, and other particles. If a surgery team member touches the apron, the (gloved) fingers become contaminated and then the bacteria can be transferred to the patient. MRI uses electromagnetic waves in a certain frequency range (said to be radio waves) to penetrate the body and to flip some of the protons in some of the nuclei within the body. Those protons are initially aligned by a large magnetic field, and after they are flipped by the electromagnetic waves, they rather quickly regain their alignment. Monitoring equipment records the progress of that realignment, and very sophisticated computer programs transform the recordings into images of the material containing those protons. This is entirely safe because the magnetic field and radio waves cause no harm. Indeed, radio waves from various nearby radio stations, telecommunication antennas, and even telecommunication satellites penetrate you all the time. If the procedure is safe, why then, on very rare occasions, have patients been burned during the procedure? Why have some patients with tattoos undergone a “tingling” or “tugging” sensation in the vicinity of the tattoos, and why have some of them been badly burned? All electrons come with their own magnetic field (an electron is a magnetic dipole, having both a north pole and a south pole). However, in most materials, the orientations of these electron magnetic fields are random and thus tend to cancel out. For example, the magnetic fields of the electrons in your body all cancel out and that is why you are not slammed up against the refrigerator door as you pass it. A ferromagnetic material is different because a quantum mechanical effect (exchange coupling) tends to align the magnetic fields of many of the electrons, which form domains with a net magnetic field. An example is the needle in a common compass --- the alignment of many electron magnetic dipoles makes the needle itself a magnetic dipole. The usefulness of a compass is that the needle tends to rotate to align with the horizontal component of Earth’s magnetic field. If you bring a strong magnet near the compass and thus change the direction of the magnetic field at the needle’s location, the needle rotates to a new alignment. Something similar can happen when someone with a tattoo (or permanent eyeliner) undergoes a MRI procedure becomes some of the black or blue-black pigments contain the ferromagnetic material known as magnetite, an iron oxide. When the patient is moved into or out of the magnetic field in a MRI apparatus, or when the strength of the magnetic field is varied, the ferromagnetic material tends to be reoriented, much like the compass needle is reoriented. The slight rotation of the particles of magnetite can produce a sensation of tingling or tugging. Actual burning, however, appears to occur only when the tattoo design includes a complete (or nearly complete) loop of the magnetite particles. Then the radio waves can create (induce) a current in the loop. Such magnetic induction is common in many electrical appliances. When a constant magnetic field pierces through a conducting loop such as copper wire, nothing special happens. But if the magnetic field varies, then the variation produces an electric field along the wire and that field forces some of the loosely held electrons in the copper atoms to move as a current in the loop. Those conduction electrons are propelled by the electric field but quickly collide with atoms in their way, dumping their kinetic energy into the atoms. This process is repeated as long as the magnetic field varies, and the repeated dumping of energy into the atoms shows up as thermal energy. In the MRI procedure, the magnetic field of the radio waves continuously oscillates in direction and magnitude. So, if there is a loop of magnetite particles, there can be a steady production of thermal energy along the loop, leading to burns. That single attachment between the finger and the monitoring equipment (which was outside the MRI apparatus) posed no danger. However, the wire extending from the finger happened to touch the patient’s arm. The section of wire between finger and arm and the part of the arm between those two points then functioned effectively as a complete conducting loop. When the radio waves were turned on, their rapidly varying magnetic field created a current around this loop. The large resistance to the current at the skin–wire contact points led to the severe heating and burning there. However, because the patient was sedated, the injury was not discovered until after the patient was withdrawn from the MRI apparatus. These days MRI technicians are trained to avoid this type of accident and also to interview patients about their tattoos and any metal implants. and scroll down to item 5.40 or search for “mri”. Nov 2011 Here is a quick item: Where does magnetism come into play at breakfast? Certainly the common breakfast foods of eggs, toast, and coffee are not magnetic. But some of the common breakfast cereals are. Look at the nutrition panel on the side of the cereal box. If you see that the cereal provides a certain percentage of the daily iron requirement or if you see a statement such as “iron fortified,” then you are consuming magnetic iron particles. That is a good thing --- you need the iron. Here is a video that demonstrates how you can separate out the magnetic particles from the cereal by using a strong magnet salvaged from a computer hard drive. February 2012 Certain types of breakfast cereal are said to be “iron fortified” because they contain iron filings. You need iron in your diet, because it is part of the hemoglobin in the red blood cells and part of the myoglobin in the muscles, and those cells are responsible for the transfer of oxygen. What the video does not point out is that the magnetic property of the magnet and the filings are a quantum mechanical effect due to the outer electrons in the atoms of those objects. An electron is a magnetic dipole (there is both north and south poles, hence dipole) and sets up a magnetic field in the space surrounding it. That is a basic property of every electron, including the ones in magnetic objects and in you. However in you there is no organization of those dipoles. So, the fields are in random directions and cancel out one another. Thus, you are not magnetic, which is a good thing. Otherwise you would be slammed onto the refrigerator door every time you walked past it. The magnetic fields of most of the electrons in a ferromagnetic material such as iron are also canceled out. However, the field of an outer electron is not canceled out. Furthermore, those net fields are organized in orientation because the “orbits” of the outer electrons of adjacent atoms overlap. A more accurate description is that the wave functions of the electrons overlap. Because the electrons are indistinguishable, they must obey certain rules when their wave functions overlap. One result has to do with the magnetic dipoles. If the dipoles are aligned, the electron separation is somewhat larger than if the dipoles are in opposite directions. That means that, with the greater separation, the alignment reduces the energy of the electrons because their mutual repulsion is then less. Thus, the electron dipoles tend to be aligned because that is the lower energy state for them. The alignment of the dipoles and the greater separation of the electrons are usually said to be due to an exchange interaction or an exchange force. However, this force is not a true force, not a true push or pull. The electrons move apart because that reduces the energy of the overlapping wave functions. Such alignment occurs over a small region of a ferromagnetic material said to be a domain. The fields of all the domains could be in random directions. However, if the material has previously been placed in a strong magnetic field, the fields of the domains have become aligned and thus the material has a significant magnetic field as a whole. You then have a magnet. The next time you eat an iron-fortified cereal or play with a magnet, you are dealing with advanced quantum mechanics. December 2006 Earth's magnetic field is continuously changing in both strength and direction for reasons that are only poorly understood. Recorded measurements usually go back for only a few hundred years, and scientists have long sought ways of inferring the field for more remote times. One way involves the rock layers lying just above coal ash, which can be found in some naturally exposed coal veins. How can the rocks there (but not meters away on either side of the exposed vein) reveal the magnetic field of long ago? A vein of coal can become exposed to air if faults develop in the overlying rock layers or rivers cut down through the vein and then weathering further exposes the coal. When air becomes available, the coal can undergo exothermic reactions (energy is released) and the coal can spontaneously ignite, heating the overlying rocks. The temperature can then become high enough to exceed the Curie temperature of the magnetic grains in the rock. This temperature, named after Pierre Curie, marks the temperature at which certain naturally magnetic materials become demagnetized. Ferromagnetic materials, such as in the magnets that you might use to attach notes to a refrigerator door, are magnetic because of a quantum mechanical effect that organizes the magnetic fields of the individual atoms, to give an overall magnetic field to the material. However, this organization can be ruined by the thermal energy associated with the oscillations of the atoms. If the temperature increases, so do the oscillations and the thermal energy. At the Curie temperature for a material, the thermal oscillations win and the overall magnetic field of the material disappears. When coal burns in a vein and heats the overlying rocks above the Curie point, the magnetic properties in the grains in those rocks disappear. Once the fire burns out and the rocks cool, the magnetic organization of the atoms is reinstated. However, because they lie in Earth's magnetic field, many of the atoms in the grains line up with that field. Thus, they record the direction of the Earth's field at the time of the cooling. When scientists find such burnt rock and remove a sample, they carefully note its orientation relative to the current direction of the magnetic field. If they can determine a date for when the coal became exposed to air (they might, for example, be able to calculate when a river had cut down to the level of the vein), then they can associate a date with the recorded direction of the field. We do not know why Earth's field wanders about (and sometimes disappears or flips over, north pole for south pole), but thanks to the burnt rocks, we know that these variations are not just recent events. When different materials are put in contact, one surface can pull some of the electrons off the other surface, becoming negatively charged and leaving the other surface positively charged. However, if the air humidity is high, the water moisture can quickly neutralize both surfaces by removing electrons (if the surface is negatively charged) or providing electrons (if the surface is positively charged). Most of the time, the walls have no net charge and are thus neutral. However, on the days when they are cleaned by someone rubbing cloth over them, they can become highly charged. Let’s assume that the cloth pulls electrons off the plastic coating on a wall, leaving that region positively charged. Because plastic is a nonconductor, the positive charge cannot just be neutralized by electrons flowing up through the ground supports, and so it stays in place. When I enter the stall and walk into the electric field of the positively charged walls, electrons on me tend to move toward the walls. They can get closest on the hair strands. Because those strands are then negatively charged by the collection of electrons, they move away from the skin and toward the walls ---- thus my hair stands up. If I move my hand within a few millimeters of the wall, I can hear small sparks as electrons jump across the air gap to the wall, neutralizing pockets of positive charge on the wall. April 2007 One of the more intriguing puzzles that have come to us from images taken by the rovers on Mars can be seen in the first of the URLs listed below. The perimeter along a flat channel is lined with upright narrow plates about a centimeter high and less than a millimeter thick. Dubbed razorbacks, these plates almost seem artificial, as if they were part of a viaduct channeling water. Indeed, they and the flat channel were initially considered to be evidence that water once flowed freely on the Martian surface. However, the plates are sharp and free of dust, not rounded as they would surely be if they had been eroded by dust storms over a very long time. The electric field of the charged grains in the layer also altered where incoming grains fell. The field was strongest near sharp corners on the grains or an existing pile of grains. Depending on the sign of its charge, an airborne grain was either attracted to the sharp corners or repelled away from them. Thus, the sharp corners gradually collected additional grains and grew upward to form thin walls or ridges. The Rutgers experiments suggest that this process occurs on Mars. Once wind blown sand happens to develop a sharp corner, the corner then begins to collect additional charged grains and grows upward to form a razorback, as seen in the images from the Martian rovers. When the humidity is relatively low where I live (Cleveland, Ohio, USA), I find some of the low-humidity effects reported by the Rutgers team when I slowly pour granulated sugar onto a tilted plastic cutting sheet. The sugar that clings to the sheet collects into tenuous clumps because of charging. When conditions are right, I can also hear the effects. In addition to the sound of the grains hitting the sheet, I hear a crackling sound, somewhat like bacon being fried. Movies of their sand grain experiments are available from the Rutgers team at the second URL listed here. Aug 2010 This seems impossible --- a robot that can climb the outside wall of a building and then aim a surveillance camera into a window. Or one that can climb a pole or a tree. Still, such robots exist. Here is an example, one that clings to the wall by tiny, sharp claws. The Stickybot was inspired by geckos, which can not only climb a wall but actually run up a wall. The foot of a gecko has about half a million hairs known as setae. Each seta has hundreds of projections with triangular or leaf-shaped ends known as spatulae (because they are in the shape of a spatula). When the gecko presses a seta against a wall, all those spatulae adhere to the wall by a force known as the van der Waals force. This force is due to the electrical interaction between the molecules on one surface and those on the other surface. In a simple explanation, the electric field of the electrons in one molecule cause a slight separation of the negative and positive charges in an adjacent molecule, and that separation causes a slight separation of the positive and negative charge in the first molecule. The two molecules then attract each other. That’s the simple explanation, but the effect is actually a quantum mechanical interaction between the two molecules. This arrangement occurs at a million or more points when a gecko puts its foot against a wall. Although each van der Waals force is weak, the combination of all those forces on the foot can support the gecko. Even if the wall is microscopically rough, a foot puts enough of the spatulae against the wall to support the gecko. Each seta is angled to the wall, and adhesion occurs when the angle is kept relatively small. To unstick its foot while running, the gecko peels the seta from the wall by pulling away from it so as to increase the angle. The spatulae then come away one by one, freeing the seta. In my sketch here, you can see that the ends of the spatulae or angled instead of being directly across the diameter. When the spatulae are pressed onto a wall, the setae resist the increase in their curvature that the downward pull of gravity tends to produce. However, if the gecko pulls upward, decreasing the curvature, the setae easily peel off from the wall. The wall-climbing robots that use the van der Waals force have a huge number of polymer nanotubes that function as setae. However, whereas the nanotubes of a gecko are self-cleaning, those on the robots can become clogged with dust and must be cleaned. That draw back aside, the point is that they climb the walls using forces that I heard about only when I took my first quantum mechanics course. A different type of wall-climbing robot is being developed by SRI International in Menlo Park, California. Their robots cling by inducing electric charge in the wall, much like you can with an inflated balloon. If you rub the balloon through your hair, you charge the balloon. Since the balloon is a nonconducting material, the charge is fixed in place. So, when you touch the balloon to the wall, the charge is not simply neutralized. Let’s say that the balloon is negatively charged because it picks up excess electrons from your hair. Then when you touch the balloon to the wall, some of the electrons in that section of the wall are repelled away from the area, leaving the section positively charge. The negatively charged balloon is then held in place by the positively charged section. The pads of an SRI robot are charged by a battery. They in turn induce charge in the sections of the wall they touch, and then the pads are held in place. These robots can climb even a dusty wall. A third type of wall-climbing robot involves suction cups that are pressed against the wall and then evacuated by a motor. The pressure of the surrounding air holds the cups in place. Let me elaborate on his demonstrations. When he places the paper on the polyethylene needle, some of the semi-free electrons on the paper surface are pulled onto the needle by the surface atoms on the needle. Such charge transfer by contact is called a triboelectric effect, where the “tribo” refers to rubbing. Indeed, he does rub the paper on the needle, but there would be a transfer of electrons even if he did not. The rubbing generally increases the transfer, not because of any mechanical rubbing off electrons as if sandpaper were being applied. Instead, the paper and needle are not perfectly smooth and so they touch each other only in certain places. The rubbing simply puts more places in contact and thus increases the transfer of the electrons. The result is that the needle’s surface becomes negatively charged and the paper’s surface, having lost electrons, becomes positively charged. When he squirts a drop of water from the Teflon coated syringe, there is another charge separation: The Teflon pulls some of the electrons from the drop, which leaves the drop positively charged. If that positively charge drop happens to move directly toward the negatively charged needle, it will stick to the needle or perhaps bounce off. However, if it is headed past the needle to one side, it will tend to circle around the needle. This orbiting is due to the electrostatic force (or Coulomb force) between the rod and drop because they have charges of different signs. If an orbiting drop initially approached along a path perpendicular to the length of the rod, the orbit will be in a plane perpendicular to that length. However, if the drop’s initial velocity is partially parallel to the needle’s length, that part of the velocity will move the drop parallel to the needle while it also orbits around the needle. The path we see then is a spiral. When a drop spirals just beyond the needle tip, the electrostatic force points back toward the tip, reversing the motion parallel to the needle and bringing the drop back to the right. As Dr. Pettit points out, if a drop orbits in an ellipse, it moves faster when it is closer to the needle. The change in speed is a result of the conservation of angular momentum, which is proportional to the product of the drop’s speed and the radial distance out to the drop. That product cannot change during the orbiting. So, if the radial distance decreases, the speed increases to keep the product constant. When a Teflon needle replaces the original polyethylene needle, the story does not change. Rubbing paper on Teflon causes the same sort of charge transfer as rubbing paper on polyethylene. In the middle of the video we see a nylon needle near the syringe. That needle was also rubbed with paper, but now the charge transfer is opposite: the paper pulls electrons off the surface of nylon. So, the nylon needle becomes positively charged. As before, water drops leave the syringe positively charged. Thus, the nearby positively charged nylon needle repels them, making them even more eager to move toward the horizontal, negatively charged rod. If you would like to see the triboelectric series, which is a listing of the materials that can undergo charge transfer by contact, here is a link. When a material higher in the list makes contact with a material lower in the list, the lower material pulls electrons off the higher material and thus becomes negatively charged, leaving the higher material positively charged. July 2013 The platypus is a curious Australian animal that is one of only a few egg-laying mammals. It looks like a mash-up of other animals, with a beaver-like tail and duck-like bill. Each night it consumes half its body mass of small freshwater invertebrates such as shrimp. The surprising thing is that it hunts underwater with its eyes, ears, and nostrils closed. So, how then can it detect a shrimp, which probably hides beneath a layer of silt? The answer is that the platypus uses its bill to electrically detect its prey. Beneath the skin of the bill lie electroreceptors that can detect even very weak electric fields (down to 10 microvolts per centimeters). When the platypus hunts, it sweeps its bill left and right to disturb its prey. When, say, a shrimp moves, the nerve signals in the shrimp’s muscles discharge brief pulses of electric field in the surrounding water. A platypus not only detects the field pulses but can also determine the direction of the shrimp because of the way the field amplitude decreases across the width or length of the bill. As the bill sweeps left and right, it acts something like a radar dish picking up electric signals. When I first saw this stream-deflection demonstration, back when I began The Flying Circus of Physics, I figured that the deflection was due to induced charge in the stream. The stream may be neutral but when it is in the electric field of the charged plastic, some of electrons in the water may to the side nearest the positively charged plastic, making that side negative and the opposite side positive. The near side is then pulled toward the plastic while the far side is pushed away from it. However, because the negative side is closer to the plastic, the attraction is stronger than the repulsion and thus the stream moves closer to the plastic. A water molecule consists of two hydrogen atoms (with one electron each) and an oxygen atom. The oxygen atom shifts those two hydrogen electrons away from the hydrogen nuclei, leaving the hydrogen side of the molecule positively charged and the oxygen side negatively charged. Such an arrangement of positive and negative charge is called an electric dipole. The research paper that convinced of the dipole explanation for the deflection also investigated other liquids, some of which did not consist of electric dipoles. The researchers demonstrated that without electric dipoles, the deflection disappeared. January 2014 As everyone knows, if you bring two magnets close, they will either attract or repel each other, depending on their orientations. Let’s consider two disk magnets. On each, one face is a north pole and the other face is a south pole, and magnetic field lines leave through the north pole, loop around the side of the magnet, and enter through the south pole. Place the two magnets on a reasonably smooth table (to make the frictional force on each from the table top negligible) and then release them with a small separation. If, for example, both top faces are north poles, the magnets repel each other. That is, the magnetic field of each magnet creates a repulsive force on the other magnet. If the two magnets have opposite poles face up, they attract each other. The results are simple and routine, but let’s repeat these experiments for a set of magnets available from www.grand-illusions.com. Two neodymium disk magnets are stuck together to form magnet A and then two more of them are stuck together to form magnet B. The simple repulsion and attraction can easily be seen when the A and B are brought near each other. Let’s arrange for the north pole of A be face up and the north pole of B to face down so that A and B attract each other. Next, we slip magnet A into a closely fitted ring in which six small neodymium disk magnets are held. The small magnets all have their north poles face down, the opposite of A. What happens when magnet B is released near this composite? Well, the small magnets in the ring repel B but A in the center attracts B. So which tendency wins? The result is shown in this video. When B is released, it is initially moves toward the composite because the attraction by A dominates the repulsion by the small magnets. But then, at a certain separation, B stops because the repulsion has increased enough to balance the attraction, and the forces on B are said to be in equilibrium. If you push B closer to the composite, the repulsion increases and B is pushed back to the equilibrium position. If you pull B away, the attraction increases and B is pulled back to the equilibrium position. The analysis is similar to one of the homework problems in my textbook Fundamentals of Physics by Halliday, Resnick, and Walker, but I use charged particles rather than magnets. The particles are easier to handle in the calculations because they are points. The magnets, on the other hand, are spread out and determining the force vectors of one magnet on another is not easy. Still, here is a rough sketch of the forces on B. The force vector for the attraction is in the positive direction of the x axis. The six force vectors for the repulsion are leftward but angled relative to the axis. I have drawn only two of those forces, the ones from the nearest small magnets. Notice in the video that equilibrium is reached when those two magnets are symmetrically positioned with respect to the x axis. Thus, one of the force vectors is angled up as much as the other force vector is angle down, and the sizes of the vectors are the same. I can break each vector into its x component and its y component. Then out of symmetry, I see that the two y components (one up and one down) merely cancel, and the net force is the sum of the two x components that add. There is such an arrangement for each of the three pairs of small magnets. The net repulsion is the sum of the x components of those six repulsive forces. At the equilibrium position, that sum matches the attractive force, and magnet B remains stationary. If you are a graph-type person, this graph might help. It shows the strength of the attractive force and the net repulsive force versus the separation between the centers of B and the composite. The equilibrium separation is given by where the two plots cross. For any smaller separation, the repulsion curve is higher; for any larger separation, the attraction curve is higher. By the way, the web site at which you can purchase these magnets has many more scientific toys. Similarly, an inflated rubber balloon is then rubbed. Let’s say that both the plastic strip and the balloon pick up electrons during the rubbing and are then negatively charged. Thus, they repel each other. The strip is tossed up into the air and the balloon is brought under it. The electrostatic repulsion not only keeps the strip aloft but also allows you to maneuver the strip across the room. Here is a video showing such maneuvering. It also demonstrates how you can fashion a plastic strip in the form of a paper airplane. A square is folded over and a pair of edges are taped together. The tape makes that end heavier than the opposite end, causing the strip to always have its heavy end downward. Such an orientation helps stabilize the strip when being maneuvered by the balloon. Otherwise the strip is difficult to control. Also, if it becomes vertical, it can slide downward and then off to one side of the balloon. April 2015 If your pub serves food, it is then sure to have table-top containers of salt and pepper. Pour out a modest amount of salt and then on top of it pour out a modest amount of pepper. The challenge this week is to separate the salt and pepper (without, of course, using tweezers and a magnifying glass). The separation is fairly easy if the pub is not humid. Take a rubber balloon (or a length of cellophane or plastic wrap) and rub it across your clothing (or through your hair). The contact of the two surfaces allows some of the semi-free electrons to move from the clothing to the balloon. (The rubbing is needed to put many different points in contact, not to actually rub electrons off the clothing as you would use an eraser to rub out a pencil mark on paper.) Because it acquires extra electrons, the balloon becomes negatively charged and produces an electric field around itself. The grains of salt and pepper are probably electrically neutral but if the balloon is brought nearby, some of the semi-free electrons in each grain move away to the far side the grains, to be as far from the balloon as possible. In short, the extra electrons on the balloon repel these semi-free electrons on the grains via the electric field the balloon sets up. The side of each grain closer to the balloon is thus left positively charged. With the balloon nearby, the far side of grain is repelled by the balloon while the near side is attracted to the balloon. However, the two forces on the grain do not merely cancel out because the near side is closer to the balloon than the far side, and so the attraction is stronger than the repulsion, that is, the net force is one of attraction. If you bring the balloon very close to the salt and pepper, the net force on each grain can be strong enough to pull it onto the balloon in spite of its weight. However, if the balloon is not quite that close, only the lighter-weight pepper grains will jump up to the balloon and not the heavier salt grains. And that is the solution to the pub challenge because you then separate out the pepper from the salt. Depending on what you actually use (balloon, food wrap, clothing, hair, etc. ), you might find that some grains leap up to the charged surface and then almost immediately leap back down. When those grains make contact with the charged surface, they can acquire some of the electrons on the surface in the contact area. Those grains are then negatively charged, are repelled by the surface, and so leap back down. Some grains might leap back and forth several times, gaining electrons at the charged surface and then losing them when they land back on the table. April 2015 Small, strong magnets are snapped onto the two ends of a small battery and the assembly, said to be train, is then inserted into a copper coil. Amazingly, the train races through the coil until it partially emerges at the far end. What drives this electric train? Well, the energy source is obviously the battery, but what is the force that propels the train? First let me caution that this train is notoriously difficult to build. Each of the several YouTube videos about the trains have lengthy comment sections where people vent their frustrations on being unable to replicate a video. The magnets must be neodymium button magnets, which are small, light-weight, and provide strong magnetic fields. Also, they conduct electric current, which is essential for the train operation. The coil must also be conducting, should be wider than the train but not too much wider, and the spacing between adjacent turns must be not too wide or too narrow (that is, it has to be “just right”). Finally, the number of magnets on each end of the battery must also be “just right.” One video suggests 16 gauge, bare (uncoated) copper wire and a 1.5 volt battery. The coil’s turns must not be so closely spaced that the coil is effectively a cylinder but they cannot be too widely spaced either. Here is a video that visibly describes how well a train will move with variations in these parameters. In the train’s situation, the coil provides a conducting path from the positive terminal of the battery to the negative terminal. However, to reach the coil, the current leaving the positive terminal must pass through the attached magnet and, more important, through the magnetic field lines inside the magnet. Those field lines flare near both the south (S) and north (N) poles of the magnet. Here is my rough sketch of the lines. The current from the positive terminal travels through this field to a contact point on the coil (wherever the contact happens to be at a given instant). The current that reaches that contact point has been continuously deflected by the field along its way there. I need a three-dimensional sketch to show the curved path but this sketch is the best I can do in two dimensions. The result is that the current (and thus magnet) experiences a magnetic force that is tilted in the forward direction. That forward component of the force is the force that propels the train in the forward direction. A similar arrangement occurs at the back of the train but there the current enters the attached magnet and curves toward the negative terminal (rear face of the battery). If we replace the coil with a copper tube, the current would still leave the positive terminal and travel through the magnet, but now it would simply dive to the bottom of the magnet where the magnet contacts the tube. There would again be a magnetic force acting on the current but it would not have a forward component. Thus the train would not move. May 2015 The Tesla coil designed by Nikola Tesla in 1891 was meant to be dramatic, even frightening. Long sparks would leap from the coil and through the air, zapping anything in their way. The coil was charged to such a large electric potential that the electric field in the surrounding air could rip electrons from the air molecules. That left conducting ionized paths, along which the freed electrons could move and recombine with the molecules. The conduction of current along the ionized paths heated the path so rapidly that the air suddenly expanded, sending out an acoustic shock wave. The recombination of the freed electrons with the air molecules produced light. So, Tesla had a splendid light and sound show, one that could even kill you if you wandered close enough to catch one of the discharges. The larger tesla-coil shows also include performers who purposely intercept the discharges. Indeed, the presence of a performer makes a discharge in the performer’s direction more probable. The performer is not injured or killed by the intercepted discharges because of a conducting suit that acts like a Faraday cage. The current stays on the outside of a Faraday cage instead of penetrating through the conducting walls to the interior. Metallic cars and airplanes act as a Faraday cage when struck by lightning; the passengers probably will not even know about the lightning strike. Similar conducting suits are worn by power-line workers when they must repair a live, high-voltage power line. The trick of a tesla coil is to convert the low voltage (about 100 or 200 volts) available in the usual wall AC power supply (mains) to tens of thousands of volts or more. Links below describe in more detail how this done but the main idea is that a series of coils are used to increase the voltage. Oscillations of current at a low voltage in one coil can produce oscillations in a second coil but at a lower current and greater voltage. (The voltage increases at the cost of the current.) The connection between the two coils is by the oscillating magnetic field that the oscillating current in the first coil. The main tower that you see in a tesla coil contains the final coil with a great many turns. It is excited by a flat coil with far fewer turns at its base. The operation of tesla coil is actually tricky because the oscillations in the various stages must be in synch (that is, in resonance) in order for the power to be efficiently transferred from the wall supply to the final coil. When a tesla coil is played with music, a computer system must control the onset of the oscillations in the coils, in order to properly time the sound and light in the sparking. February 2016 If you drop a new alkaline battery, let’s say an AA battery, from a given height onto a hard surface, it will not bounce by much. However, if you exhaust the battery and again drop it from that same height, it will noticeably bounce from the hard surface. Why the difference? Of course, an exhausted battery is exhausted in the sense that it no longer can supply electrical energy. And of course Einstein convinced us that E = mc2, but the mass associated with the energy that a battery can supply is immeasurably small. So, a change in mass is not the reason for the bounce. Here is a video that shows the bounce-no bounce situations and reveals the answer behind the two behaviors. In short, a new battery has a spongy electrolyte that compresses against the bottom of the battery casing during the collision, preventing or decreasing the bounce of the casing. In an exhausted battery, the electrolyte is rigid and cannot absorb any of the impulse during the collision. February 2016 This effect has been rumored for years but these days we have some video evidence. A car fob (remote opening device) has a maximum range. If you are even farther from the car than that maximum, the radio frequency signal that you send toward the car is too weak to trigger the detector, and so the car does not lock or unlock. However, strangely enough, if you hold the fob next to your body (the head is usually used), you increase the maximum range of the fob. According to the explanation, your open mouth somehow sets up a resonance that builds up the signals, such as resonance can build up in a woodwind instrument. I don’t think so. The fob puts out a radio signal at a wavelength of about a meter, much longer than the dimensions of your mouth. Besides, unless you are a Cyberman from Doctor Who, your mouth is formed from biological materials, not metal from which radio signals will bounce around. This explanation is much better. The radio signal causes oscillations of the charged particles in the head or the water in the container, and those oscillations send out additional radio signal. But how? Here is my explanation, and below I’ll tell you how you can check it. The fob signal is emitted in a wide range of angles because when you search for your car in a parking lot, trying to aim the signal directly at the car’s detector would be difficult. The signal is not a laser beam. So, only some of the signal is actually intercepted by the detector and the rest is wasted. When you are very close to the detector, the detector occupies a fairly wide angle and intercepts much of the signal. As you walk away from the detector, it occupies an increasingly smaller angle and the signal is more spread out and thus weaker. Eventually, the intercepted signal is too weak to trigger the detector. If you then place the fob near your head (or any other portion of your body), your head intercepts some of wasted signal. That signal is an electromagnetic wave (a radio wave but otherwise like visible light). The oscillating electric fields of that wave cause any free or semi-free charged particle in its path to oscillate back and forth (electric forces from the electric fields act on the charged particles). When charged particles oscillate, they radiate electromagnetic waves. That is how a simple AM radio antenna works. Electrons in the antenna are forced to oscillate up and down the antenna, and they radiate the radio waves off to the sides. You have lots of charged particles in your head (and elsewhere). The wasted fob signal causes some of them to oscillate at the frequency of the wave, and so they emit radio waves off to the sides at that frequency. Some of that fresh radiation happens to be toward the detector, and thus the detector is receiving added signal in addition to the signal coming directly from the fob. That can be enough to trigger the detector. Oh, but don’t worry about the radio waves. Unless you live in an extremely remote region, radio waves go through you all the time from all the communication systems (cell phone, television, radio). And when I say that the particles oscillate, their motion is on the atomic scale, not something that would make you tingle. Here is how you can test my explanation. Find the maximum range of a fob when held at arm’s length, and then move somewhat beyond it. (That may be tricky if your car is like mine and refuses to acknowledge any signal when the fob is pressed several times in a short time.) Hold the fob next to your chest, neck, head, or even thigh. Can you trigger the detector? If so, then hold a container of water away from your body with the fob next to it, as we see in the video. However, don’t use tap water as that demonstrator did. Use distilled water a pharmacy or food store. Distilled water does not contain the salts and other impurities found in tap water and thus has no charged particles. So, in my explanation, the fob should not be able to trigger the detector when you use distilled water. Next, gradually add table salt (NaCl) to the container. The molecules split into positively charged sodium ions and negatively charged chloride ions. I believe that when enough salt has been added, the fob will trigger the detector.